1. Add IOS certifivate in Apple Developer page. 2. Add identifiers App IDs with Network Extension enabled in Apple Developer page. 3. Add provisioning profile in Apple Developer page. 4. Create xcode project and type the correct bundle ID which made in apple developer page. And sign right team. 5. Add capabilities and library (Network Extension framework). 6. After 5, Entitlement file is generated automatically in my xcode project. 7. At last time I wrote the code like this. But I can't get any wifi list. In my source, variable "isAvailable" is returned false. To resolve this problem I tried this additionally. Add "com.apple.developer.networking.HotspotHelper" with boolean type and "true"
-> result of this : I can build the project, but I can't install the app in my device. I get error message like this "The excutable was signed with invaild entitlements". I don't know why is not working. Do I miss something for authenticate to use Network Extension library or NEHotspotHelper?? Or is there any error in my source?? ** After I requested Network Extension library to apple, I got message like this from apple. 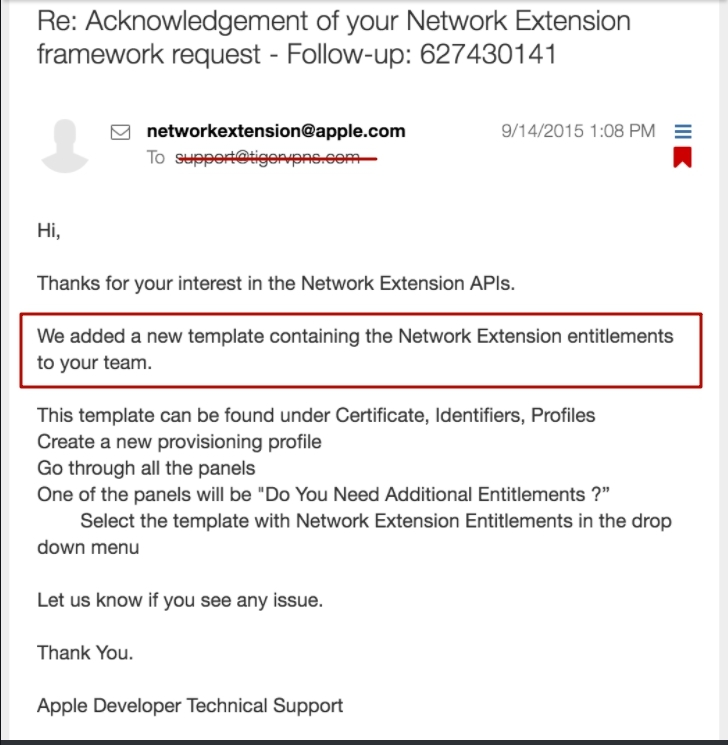 Thank you for requesting information about the Network Extension framework. Please note that as of November 10, 2016 this process is not required for developers who wish to use App Proxy, Content Filter, or Packet Tunnel APIs. To use these services please navigate to your Developer Account at https://developer.apple.com/account/ and select the Network Extension capability for the App ID you will be using for your app. If you are requesting an entitlement for Hotspot Helper APIs your request will be addressed at our earliest convenience. You need to complete a questionnaire at https://developer.apple.com/contact/network-extension, and then you can use NEHotspotHelper to return a list of hotspots. Not the answer you're looking for? Browse other questions tagged ios objective-c certificate xcode8 nehotspothelper or ask your own question. Network Extension entitlement, how to enable it?